The brain is divided into two halves called the right and left hemispheres. The brain can also be divided into four areas known as lobes (frontal, temporal, parietal and occipital) plus two other important areas called the brain stem and the cerebellum. 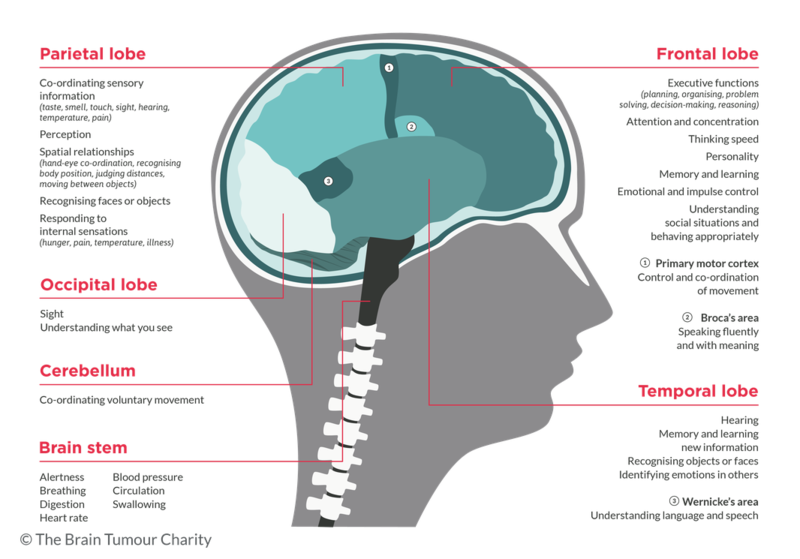 The presence of a brain tumour can cause damage to healthy brain tissue, disrupting the normal function of that area. Remember that many of the symptoms due to raised intracranial pressure (ICP) can be caused by other medical conditions. So if you are experiencing these symptoms, it does not necessarily mean you have a brain tumour. numbness on the opposite side of the body from the tumour. problems with dexterity (skills in using your hands).